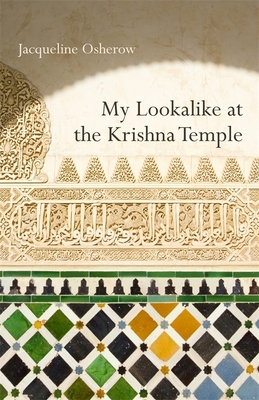 In My Lookalike at the Krishna Temple, Jacqueline Osherow considers expressions of spirituality from cultures all over the world and investigates previously unexplored aspects of her relationship to Judaism and Jewish history. While some poems reflect on practitioners of self-imposed isolation, from the monks in Fra Angelico's frescoed cells to Emily Dickinson to the Kotzker Rebbe, others explore topics as varied as architecture, geometry, faith, war, and genocide. Osherow finds beauty in Joseph's dreams, the euphony of crickets, and the gamut of symmetries on display in the Alhambra. The scent of lindens serves as a meditative bridge between Darmstadt, Germany, alien and unnerving, and a familiar front porch in Salt Lake City, where the poet freely engages with the natural world: "Don't worry, moon; we all lose our bearings. / You don't have to rise. Stay here instead. / I'll spot you; we could both use an ally / and rumor has it disorientation / is the least resistant pathway to what's holy." Osherow takes readers on a journey as tourists and global citizens, trying to find meaning in an often painful and chaotic world. Jacqueline Osherow is Distinguished Professor of English and Creative Writing at the University of Utah and the author of seven previous books of poems. She has won many honors for her work, including a fellowship from the John Simon Guggenheim Foundation and the Witter Bynner Prize from the American Academy and Institute of Arts and Letters.